Gum disease is one of those things very few people expect to come across. Most think that simply brushing their teeth every day will be enough to prevent it from occurring. But gum disease is remarkably common across the globe and can lead to some serious implications if not checked out sooner rather than later, including deadly infections in the head and brain area. It’s a very serious thing that few people know about, but even when you find out you have diseased gums it’s not too late to do something about it and take care of it. Very few gum diseases do any serious permanent damage and all can be treated. So how can you tell if you have gum disease? Well there are various gum disease symptoms to consider that might occur during your regular life. One of the first signs of gum disease is bleeding of the gums during and after your brush your teeth. This is because your gums are probably weak, and the motion of brushing caused them to start bleeding. Of course this particular example might happen to people normally without gum disease, so you must look for other symptoms before jumping to that conclusion. The condition of the gums themselves can tell you a lot. If you suspect you have gum disease try getting a mirror and examining them. Infected gums are typically red and swollen and can be very tender to the touch and to pressure. Furthermore depending on what stage the disease might be in your gums might have started to recede back, weakening their connection to the roots of the teeth. As they receded they get more shallow, meaning you can start to see the grooves between the roots of your teeth, causing small pockets to form where the gums normally fill. 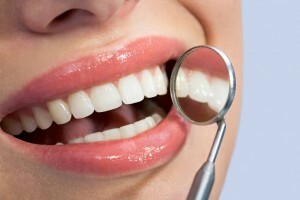 If you suspect you have some form of gum disease then the best thing to do from there is to see a health care provider. It might be hard to decide where to go since most doctors have a specific area of the body that they specialize in, but if you’re at a loss and need to see somebody then go to a clinic and ask, or check with your dentist during your next check-up. If you have gum disease then it’s not too late to handle it. The first step is to start immediately to floss and use mouthwash. While they are normally methods to prevent disease, they can be very useful in helping to fight it as well. Flossing will help to further strengthen the gums and prevent the disease from making them any weaker, and mouthwash will help whatever prescription you have in killing the bacteria that’s started to live on your gums. It’s never too late to start fighting gum disease, and there is a huge array of methods you can use to fight and prevent it. The worst thing you can do if you suspect you have a gum disease is to neglect it, however, as some people are known to do. Neglecting it allows the disease to continue working away at your gums, it won’t take care of itself, and once it gets to a certain point it can start drastically affecting your health on top of everything else. Infection is not something to ignore, so if you think you have a gum disease make an appointment today to see somebody about it. While working with Glebe Dental in promoting healthy gums and teeth, Melissa Chambers is also writing about health, fitness, nurtition, and dental care.